safe though all of her travels. The museum exhibits include artifacts spanning over a century of the lives of the pioneering history described in the “Little House” books. 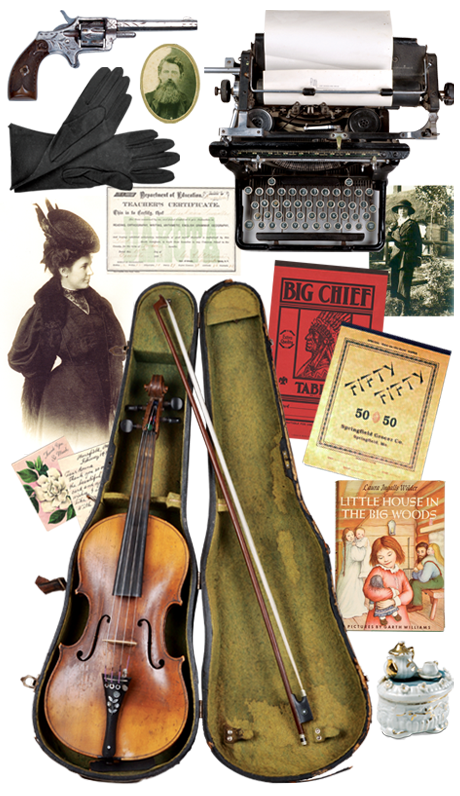 Visitors can see Pa’s fiddle, handwritten manuscripts for the “Little House” books, keepsakes of the Ingalls and Wilder families, tools and articles made by Almanzo, needlework made by Laura and many other items familiar to her loyal readers. Also featured within the museum is a section dedicated to the life, writings and career of Rose Wilder Lane. Rose’s desk, her manuscripts and souvenirs from world travels are displayed to reflect the creative and exciting life of the Wilders’ only daughter. The museum at Rocky Ridge Farm is by far the most comprehensive Ingalls and Wilder family collections in the world. It’s truly a testament to Laura’s love for these treasures that they remained safe though all of her travels. The Laura Ingalls Wilder – Rose Wilder Lane Museum operates solely on sales and con tributions from visitors and members of the non-profit Wilder Home Association. If your interested in the restoration, preservation and education of Laura’s legacy, learn how you can Become a Member.